The latest version of iTunes includes the great “Automatic Downloads” ability which automatically syncs your new app, music, and book purchases to all of your other iOS devices. This is the first part of iCloud that is available free to iTunes users, but most users won’t see the benefit because it’s not enabled by default. Let’s change that. You’ll need to download iTunes 10.3 which includes iCloud beta support, and you will also need to use the same iTunes / Apple ID on the devices that you want Automatic Download to work with. 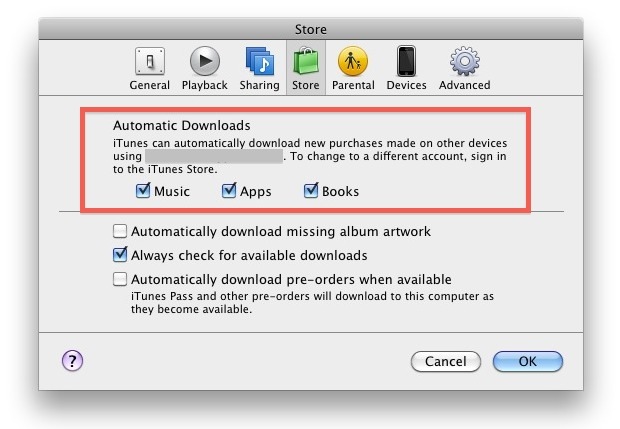 Once this is enabled, iTunes will automatically sync new purchases to your iOS devices. This means you can buy a song, app, or book on your Mac or work PC and it will automatically transfer to the iPhone in your pocket and your iPad at home, as long as you’re connected to the internet through Wi-Fi or 3G. This is obviously a great feature, just keep an eye on data usage if you’re on a limited data plan and downloading via 3G frequently. iCloud itself is free, but your cellular data plan isn’t. Update: this feature seems to be limited to iTunes users based in the USA for now, this will likely change as iCloud rolls out of beta. For all the hype surrounding iCloud you would think such a nice feature would be turned on automatically. Is it just me or the ‘Music auto-download’ option is removed by default in the UK! I have the same thing in the UK – no music auto download. Good catch, I think the iCloud beta is limited to US users for now. Post has been updated. Does anyone know when iTunes Automatic Downloads for music will be available in the UK? Same in Germany. No music auto download. No auto download for music in Canada yet either. So, it’s only available to an US account…. So do you have to do this in order for automatic back up to work on my iPod?